ToTheZeroth News is a cloud-hosted RSS/Atom feed reading service. It was originally designed to replace Google Reader's smartphone-oriented interface, which was great not only for smartphones but also for desktop browser sidebars. We do like to think, however, that for this purpose ToTheZeroth News is even better! Many websites, especially news sites and blogs, publish their content, or part of it, in a structured format that can be used outside the actual website. There are two such formats that are popular – RSS and Atom – and ToTheZeroth News handles both. The point of the feeds is that you can be informed when something new is published, rather than having to enter the websites over and over to see if something has happened. the option to filter posts, for instance based on author tags or words in the title. ToTheZeroth News is not for you if you find it essential to be able to read the actual page content, images and all, within your feed reader. This one is built entirely on the idea that the feed reader acts as a light-weight teaser, and if you want to read the article, you click the link to open it in the original website. It's also not for you if you want a news service that does anything besides reading feeds, because that's all this one does. Will it work in my browser? It works in the latest version of all major browsers. It might work less well (such as missing import/export) in older versions. Internet Explorer 8 and lower are not supported. Click the button to open the single-panel reader. A good idea for your cellphone browser, and very suitable for Firefox's sidebar (or the web panel in certain Opera versions). The only thing you need to sign up is an e-mail address. If you use a browser without a sidebar, you will probably want something that makes better use of the whole width of your desktop browser. 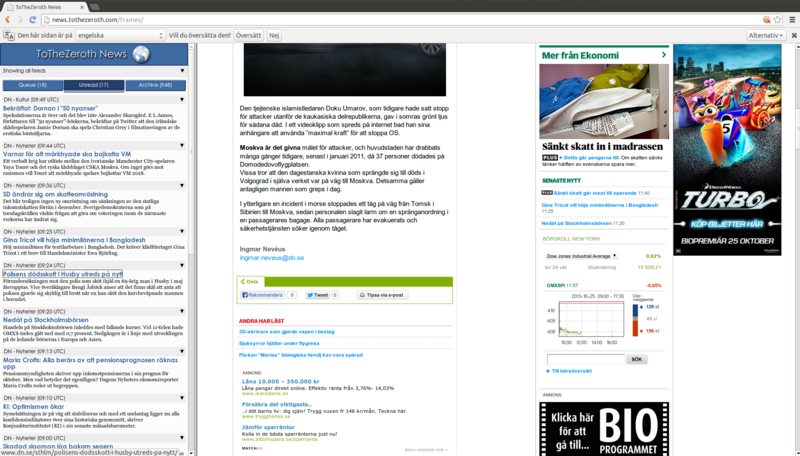 As a simple hack, this version displays the feed reader in one frame and opens articles in the other, larger frame. For more information about the possibilities, take a look at the support forum. You can use ToTheZeroth News for free for as long as you like, and without any ads or other intrusions, but your account will be limited to a certain number of feeds. To be able to add more, you will need to contribute a small amount of money to help pay for web space and maintenance. We will never share your e-mail address with anyone, and we couldn't share your password with anyone even if we wanted to, because we never see an unencrypted version of it. We don't encrypt anything else, so we can't guarantee that nobody is eavesdropping on your Internet traffic to find out which feeds you subscribe to. If people are that interested in you, then congratulations are probably in order. What, no native iPhone/Android/Blackberry/Windows/Mac/Linux application? Not at the moment. The focus has been on getting a cross-platform web interface running. But it's certainly possible to create such apps, and there may be more releases in the future. One advantage of a native app would be the ability to manage items while offline, and archive them after they are no longer available from the content provider. Actually, if you have a little programming skills, you could make such an app yourself – to use, share with others, or even sell. One of the nice things with ToTheZeroth News is an open, well-documented REST API. If you're interested, check out the API documentation. Or something doesn't work as expected? Take a look at the support forum.